Why do 40,000 people descend on this remote North Yorkshire location at the end of March. Is it for a hip, under-the-radar music festival? A cool arts happening? Erm, no – amazingly, they’re all coming to see the delightful daffodils of Farndale, whose burst into colour traditionally signals the start of spring in these parts. The visitors don’t arrive all at once you understand, though tens of thousands of people passing through the bucolic agricultural dale in a few short weeks of flowering is challenge enough. More to the point, these aren’t just any old daffs, but true, native, wild daffs that thrive on the river banks and meadows and across the dappled woodlands of gorgeous Farndale. They are smaller, paler and more petite than the bunches you’ll see in supermarkets, florists or even your own back garden: Narcissus pseudonarcissus, if you want the technical term – sometimes known as the ‘Lenten Lily’ after the time of year (mid-March) that it usually starts to flower. The sight is a dramatic one – carpets of yellow stretched right the way along the course of the gentle River Dove. A well-signposted path from the hamlet of Low Mill takes you on a wonderful riverside daffodil walk, up as far as the pub at Church Houses – say around three miles there and back, and a couple of hours of your time depending on how many photographs you stop to take. Photos, incidentally, are all you’re asked to take. Picking them is a strict no-no, as the Farndale daffs are protected by a local byelaw. They’ve grown here for centuries and caring for them should keep them safe for many years longer yet. Word this year is that due to the unseasonably cold weather the daffodils are a bit late. But Rangers from the North York Moors National Park are already in place at Low Mill at weekends, while the special Farndale Daffodil Shuttle Bus from nearby Hutton le Hole starts up on Sunday 24 March. Now all you need to do is take a walk Where the Wild Daffs Are. 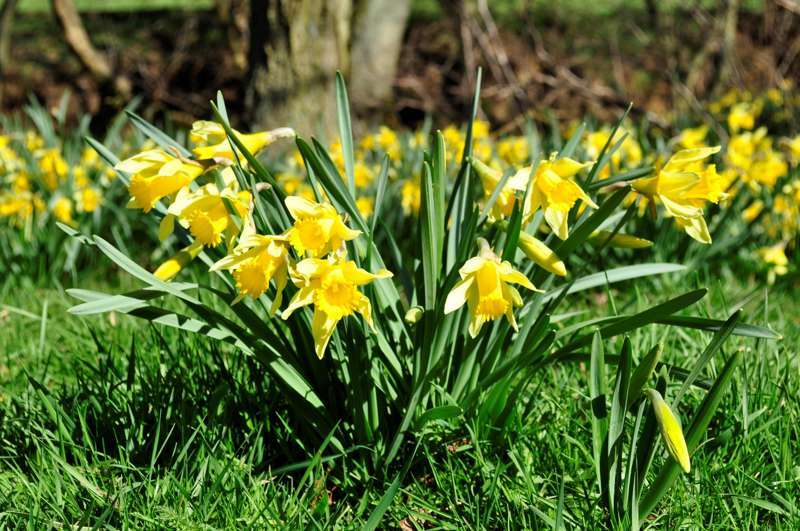 The Farndale Daffodil Shuttle Bus operates on Sundays from 24 March to 14 April, plus Good Friday, Easter Saturday and Easter Monday. Pictures are courtesy of Shock the Senses and Catriona Mclees.